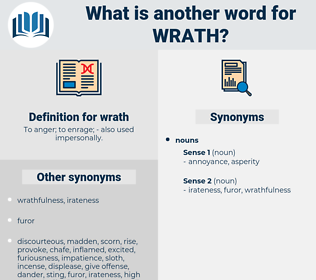 What is another word for wrath? To anger; to enrage; - also used impersonally. indignation, tantrum, resentment, furore, temper, passion, furor, outrage. composure, satisfaction, calm, pleasure, delight. calmness, placation, calming, soothing, ease, pleasing, comfort. 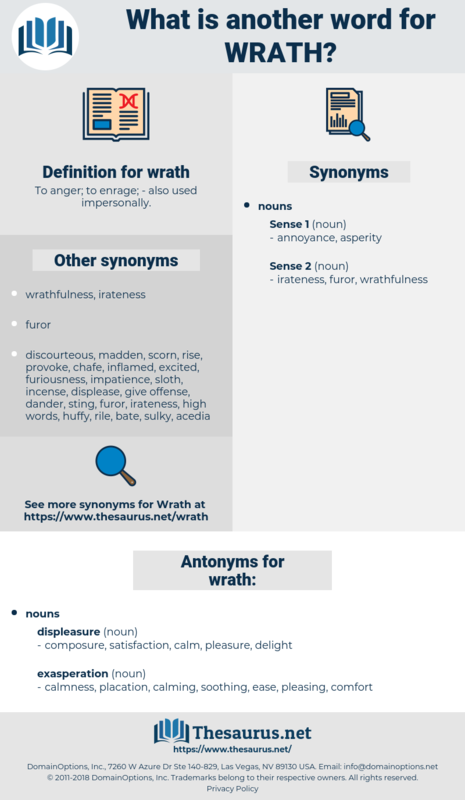 exculpation, pardon, remitment, commutation, exoneration, forbearance, forgiveness, vindication, overlooking, acquittal, charity, indemnity, impunity, long-suffering, self-control, parole, disregard, amiability, love, exemption, leniency, gentleness, condonation, mildness, self-restraint, reprieve, immunity, amnesty, remission, peaceableness, absolution, peace, peacefulness, release, lenity. Forgive and forget, my friend - forgive and forget; no longer let the sun go down upon your wrath. His soul was wrath within him.